That mainly means sampling the previews of whatever products are being released. 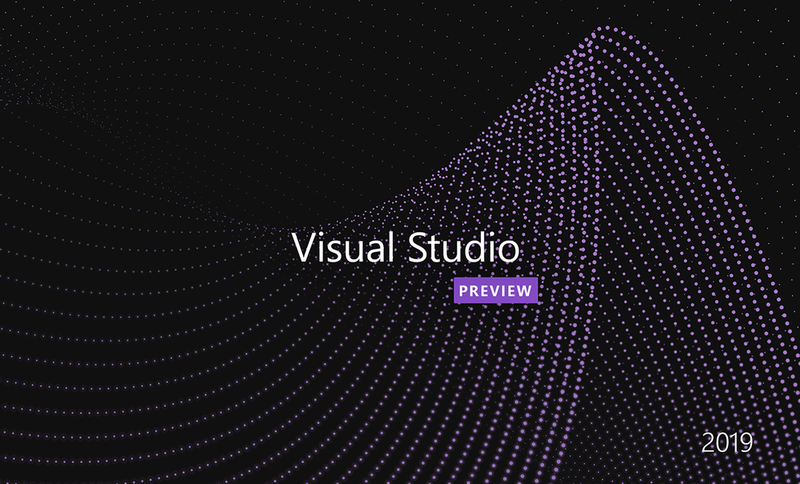 On this occasion I’ll be sharing some thoughts about the latest incarnation of Visual Studio 2019 (Preview) on Windows. Nicer loading screen with improved UX. It looks like an actual User Experience person has been placed on the project. As such some of the user interactions are improved. Visual Studio 2019 (Preview) quick start page has been improved. In keeping with Microsoft CEO’s ethos of “any language, any framework, any platform”. The new “Create Project” user interface has gotten some attention. Conceptually at first gland I liked this. However when I came to try and create a project I actually found this more cumbersome. I prefer the hierarchy of the old interface. I wouldn’t mind some sort of grouping to the left of the project list which allowed you to drill down. As I’m writing this I’m noticing the ‘Project type‘ drop down list and maybe this just takes a bit of adjustment to get used to. With Visual Studio Code already enjoying Live Sharing I was wondering when it would come to the full fat version of Visual Studio. Well I’m glad to say it’s being built into the 2019 version so we can all remotely pair with ease. As you can see my favourite testing tool NCrunch no longer has it’s own top level UI Navigation but rather sits under ‘Extensions’. Look at all of this screen real estate. With the top level user interface bar being restricted to 2 lines it frees up your screen for the most important thing. Staring at your code wondering why it isn’t working. Visual Studio 2019 ships with Dotnet 3.0 and so comes with it some new features and project types. I’m not going to list all of them. That would be terribly boring. I will leave this as an exercise for the reader to download it and explore for themselves. New project template for Creating ASPNETCore web service running in Kubernetes! I think this is probably the most important thing about Visual Studio 2019 that I noticed. It’s faster, and lighter! What does this mean in real terms? I could measure performance between the two and do some comparisons, but simply put I would have to time every interaction and measure the difference which to me is boring. So instead I’ll simply say that the speed improvements are enough for me to not buy a new Macbook Pro. I currently own a Late 2013 model that sounds like it’s taking off because I run Windows in a Parallels Virtual Machine. Yes you read that correctly. Why would I do this? Xamarin development! The point at which I did my last wipe of my Windows virtual machine and re-installed it the Bootcamp installation was bugged and wouldn’t work. Bootcamp partitions can be imported into Parallels and generally run blazing fast. However with a pure virtual machine eating up almost 50% of my hard drive my machine was starting to be noticeably slow. With me experiencing lag at times typing.. TYPING.. Although I was running NCrunch which will happily use as many cores you give it and ReSharper which is quite heavy going these days. However it doesn’t in Visual Studio 2019 Preview. Yaaay! I don’t need to spend another £3500 to get a brand new Macbook with 32gb of ram and a 1TB SSD drive. That ladies and gentlemen is the primary driver behind me writing up this article. With a nice new look and some tender loving care from someone familiar with user experience over at Microsoft. Visual Studio 2019 (Preview) on Windows not only does the newest incarnation of Visual Studio look great it’s more performant and I find myself being less frustrated with it. Go team Visual Studio!